Your elegant affair deserves a favor filled with charm and sophistication! 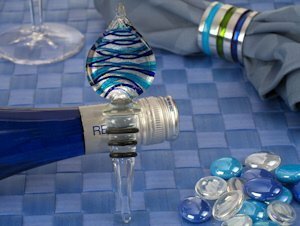 Our teardrop design bottle stopper top is crafted from Venetian-like glass in vibrant blue and silver colors then attached to a crystal clear base to perfectly complement your favorite bottle of wine. Each one is handmade, so no two are alike! We package them in an elegant two piece silver gift box. Stopper measures 5" in length.